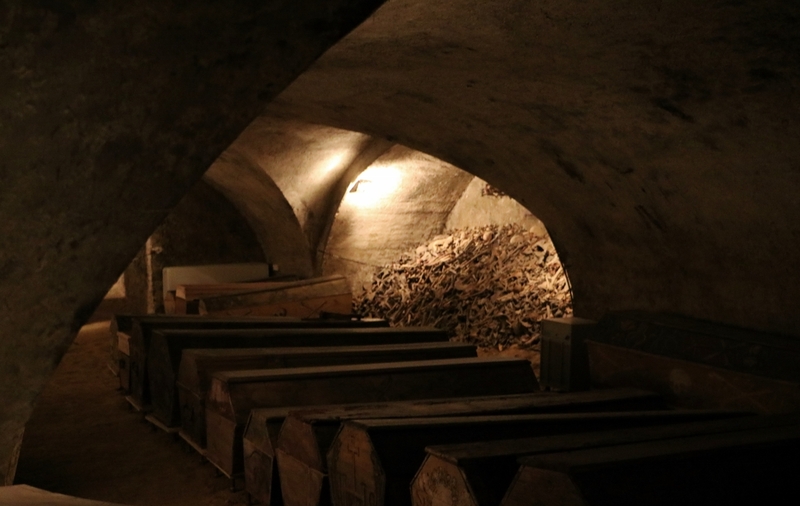 It began with individual burial vaults for the nobles, which were accessible through the burial vault slabs in the church floor, which still exist today. In 1676/78 the big parish church was located under the nave of the church, as was the priest’s crypt under the high altar. This opened the access to the middle class. The practice was to connect the individual neighbouring vaults by alleyways. The Mariahilf cemetery in the area of St. Michael’s Church was consecrated in 1660, but was rejected by the Viennese living in the inner city as too far away. This meant that the people living in the center were buried in St. Michael’s Church and the people in the remote parishes were buried in Mariahilf. According to the court order of Emperor Joseph II of 11 December 1783, no further burials were carried out in the entire inner city and thus also not in the crypt of St. Michael’s either. At the same time the remote churches Mariahilf and St. Joseph were declared independent parishes. Even if these monasteries still had to pay their funeral fees to St. Michael’s Church until 1833, this marked the end as a burial church.